A two-point spreader bar allows the use of a wide range of loop slings in many different varieties and sizes. A two-point spreader bar for use with Maxi Sky allows the use of a wide range of loop slings in many different varieties and sizes. 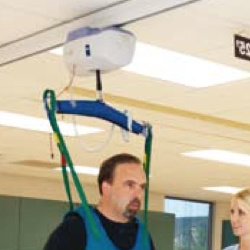 This spreader bar also integrates with the Walking Jacket, which enables therapists and caregivers to assist residents with standing, stepping and walking training.